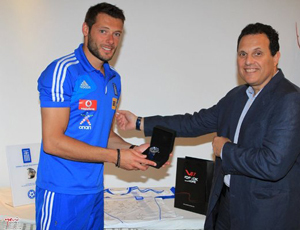 Vostok Europe watch company in 2010, is presented as an official partner of the Greek national team in football. In 2012, in connection with the participation of the Greek national team in European Cup Final Brand Vostok Europe announced a new line of limited edition watches. Novelty has an upcoming event symbolizing the elements of design, colors and bright football tournament underlined sporty style. 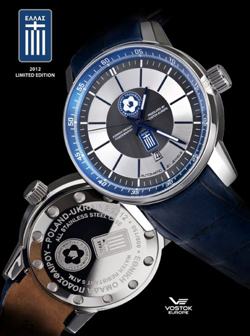 Vostok Europe watches for the Greek national team in football. Unique in its construction of the model face: it is divided into several circular sectors made in contrasting colors. Second scale is blue in color, marked with Arabic numerals and white hour indices, is located on the flange face. It is followed by minute scale in black and silver hour scale with contrasting labels. In the center of the dial is a black circle, in which the central hour and minute hands coated with luminous material. At 6:00 position posted date aperture. Team logos Greece and the Greek Football Federation, inlaid on the face, are also present on the back of the clock, along with the limited number of individual lines and the words «Poland-Ukraine 2012″. Presenting Vostok Europe watches the Greek national team players. In building new stainless steel built in a reliable and robust automatic. Buy watches will be possible to have official representatives of the company Vostok Europe. Sports & Classics in the new model V.01 Titanium Red Gold of the company Valbray!